The aim of the article is to investigate the features extraction from microscope images of pollens for a classification of honey on the base of its botanical origin. A filter-bank of Gabor filters (as a biologically inspired recognition system) is used to obtain features, which are then post-processed using normalization, down-sampling (by bicubic interpolation), and principal components analysis (PCA). PCA is used for reducing the features size and a proper visualization of the features extraction results. Microscope images from the European pollen database, including pollen images of linden, acacia, lavender, rapeseed, and thistle, are used to illustrate capabilities of the proposed features extraction approach. The performance of the proposed algorithm is evaluated by simulations in MATLAB environment. Chudyk C., Castaneda H., Leger R., Yahiaoui I., Boochs F. Development of an Automatic Pollen Classification System Using Shape, Texture and Aperture Features. In: R. Bergmann, S. Gorg, G. Muller (Eds. ): Proceedings of the LWA 2015 Workshops: KDML, FGWM, IR, and FGDB, 2015, 65-74. Trier, Germany. Daood A., Ribeiro E., Bush M. Pollen Recognition Using Multi-Layer Feature Decomposition. Proceedings of the Twenty-Ninth International Florida Artificial Intelligence Research Society Conference, 2016, 26-31, Association for the Advancement of Artificial Intelligence. Movellan J. R. Tutorial on Gabor filters. Open Source Document, 2002. Ruoff K. Authentication of the Botanical Origins of Honey. A Dissertation for the degree of Doctor of Sciences. University of Helsinki, 2006, p.32. Serre T., Riesenhuber M. Realistic modeling of simple and complex cell tuning in the hmax model, and implications for invariant object recognition in cortex. Technical report, DTIC Document, Massachusetts institute of technology — computer science and artificial intelligence laboratory. 2004. AI Memo 2004-017, CBCL Memo 239. Statistics Toolbox™ User’s Guide, R2014a, © Copyright 1993–2014 by the MathWorks, Inc.
NIKOLOV, Dimitar Nikolov; TSANKOVA, Diana Dimitrova. Features Extraction for Pollen Recognition Using Gabor Filters. 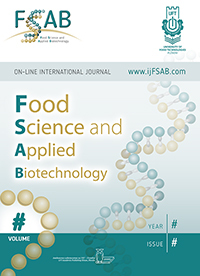 Food Science and Applied Biotechnology, [S.l. ], v. 1, n. 2, p. 86-95, oct. 2018. ISSN 2603-3380. Available at: <https://www.ijfsab.com/index.php/fsab/article/view/11>. Date accessed: 26 apr. 2019. doi: https://doi.org/10.30721/fsab2018.v1.i2.11.